Reality is reality and facts are facts. But the reality and facts of Rafael Nadal’s easy win over Roger Federer Friday in the Australian Open semifinal are based solely on what you expected. What I mean is this: If people expected Federer to beat Nadal, then they really haven’t been paying attention lately. He was never going to win this match. 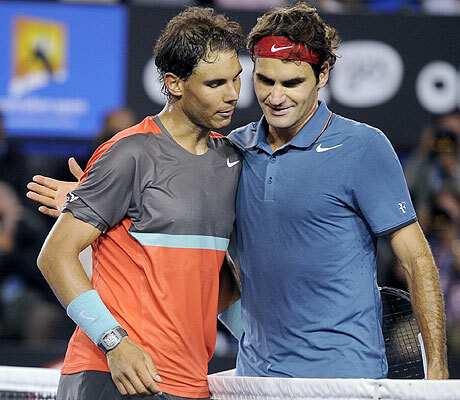 Cold reality is that Nadal is far better now than Federer. But the fact is this: These past two weeks have been a massive success for the reality of Roger Federer. Jack Nicklaus used to say that he never wanted to be a ceremonial golfer, that he was there to win. Without changes, Federer was going to be just for show by the end of this year. He might not have been in the top 20. Instead, at 32, he has already not only taken the first steps, but also placed himself back in position to win majors again. This entry was posted on Friday, January 24th, 2014 at 6:36 pm	and tagged with Australian Open, Rafael Nadal, Roger Federer and posted in Australian Open, Rafael Nadal, Roger Federer. You can follow any responses to this entry through the RSS 2.0 feed. Wimbledon 2014 will be critical. One would believe Roland Garros to be Rafa’s. But, winning both the French and Wimbledon in the one year has proven difficult. Which brings the likes of Murray, Djokovic, Del Potro, et al, into the frame when it comes to Wimbledon. Wimbledon 2014 will tell us whether Federer can seriously be considered a threat at Grand Slams any longer.